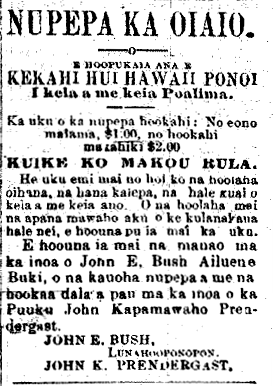 Heads of “Nupepa Ka Oiaio”, 1894.
Business and trade and store advertisements are at a reasonable rate. Announcements from outside this town, are to be sent with payment. ¹John Kapamawaho Prendergast would become the husband of Ellen Kekoaohiwaikalani Wright Prendergast. Nupepa Ka Oiaio (puka pule), Buke VI, Helu 22, Aoao 1. Iune 1, 1894. This entry was posted in Advertisement / Announcement and tagged Ailuene Buki, John E. Bush, John Kapamawaho Prendergast by nupepa. Bookmark the permalink.